This work documents the strong likelihood that Israel used bullets to steal from the American people their right to have their own leader. JFK fought a bitter behind-the-scenes battle to thwart joint Israeli-Red Chinese nuclear bomb development. Only Zionists have held the power necessary to sustain a cover-up in America's corrupt government and controlled national media. Please link to the Profile Page page with "look inside pages" for the ebook edition. Although there has been much written about the New World Order and the Rothschild Empire, this is the first book ever to document, from the beginning, the truth about this worldwide geopolitical phenomenon, explaining in the long-suppressed origins of the New World Order and the global engine of tyranny rooted in the financial empire of the Rothschild Dynasty. Examining the New World Order’s religious and philosophical roots in Jewish teachings spawned in ancient Babylon, Piper explores the manner in which followers of the Jewish Talmud rose to the highest levels in finance. And today, with the Rothschild network entrenched on American soil, the United States today has emerged as “The New Babylon” from which these modern-day Pharisees are working to set in place a global hegemony that many call the New World Order. Relying upon many rare works (some never published in English), Piper has assembled the entirety of the history of the intrigue that has established itself as the unrivaled plutocratic elite in our world today. A virtual guidebook to the path toward mankind’s survival. Please link to the Profile Page. The shocking story of the infiltration and subversion of the American nationalist movement. This amazing work demonstrates how, during the course of the 20th century, paid agents and disrupters, working on behalf of the Zionist cause and for the international interests of the Rothschild banking empire, infiltrated and subverted American dissident groups. A detailed overview of the intrigues of the infamous Anti-Defamation?League of B’nai B’rith, the corruption of the FBI and the CIA by Zionist elements, evidence pointing toward Israeli involvement in the Oklahoma bombing, the strange story of how Trotskyite elements seized command of the “conservative” movement and played a role in manipulating Sen. Joe McCarthy’s hunt for communists, a study of the secret powers behind Rupert Murdoch’s media empire and much, much more. The secret history of how America’s “neo-conservative” Trotskyites came to power and orchestrated the war against Iraq as the first step in their drive for Global Empire, the so-called New World Order. The first-ever book on the role of the “neo-cons”?in sparking the debacle in Iraq and the only book that tells the entire story—no holds-barred. This explosive study combines in 184 pages, for the first time ever between two covers, the amazing facts and figures documenting the massive accumulation of wealth and power by those who have used that influence to direct the course of U.S. foreign and domestic policy today. While there are many historical books on “the Israeli lobby,” Zionism, etc, this is the only book that brings things “up to date” and constitutes a thorough inquiry. What makes this volume so particularly powerful is that the author relied exclusively on Jewish sources to compile the wide-ranging array of data in these pages. All sources are carefully annotated for the reader’s reference. Chapters include a list of prominent figures throughout history accused of “anti-Zionism” and “anti-Semitism,” a dissection of the Bronfman family—“the Royal family of American Zionism,” an eye-opening summary of some 200 little-known, immensely wealthy Zionist families in America; a fascinating inquiry into the infamous Enron and INSLAW affairs, documenting the suppressed “Zionist connection” plus more. An excellent way to introduce new readers to a difficult topic. Deliberate historical truth distortion, firebomb attack, and other vicious tactics accompanied this running court battle involving many colorful characters, to include a Hollywood film star and the leader of America's foremost populist newspaper. Your concept of the real "good guys" and "bad guys" involved in America's corrupt national media, not to mention Holocaust-related propaganda, may never be the same after reading this book. A compendium of writings of Michael Collins Piper that include interviews with the author and reviews of his works. The "dirty secrets" include FDR's foreknowledge of Pearl Harbor, the Israeli attack on the U.S.S. Liberty, Federal involvement in the OKC bombing, the Mossad link to the Martin Luther King assassination, and how the Federal Reserve is not "Federal." This landmark work pulls no punches in asserting that Israel’s nuclear Hell Bomb is pushing civilization toward global Armageddon, that the perpetuation of this un-controlled weapons program has left the world held hostage. Explains the danger the planet faces as a direct consequence of American collaboration with a nuclear-armed Israel, a nation which has an open historical record of hostility to other peoples, based on little-known Jewish religious teachings that have been the philosophy upon which Israel—since its earliest days—has worked relentlessly to construct an atomic arsenal—its Golem—the foundation of its national security strategy. Demonstrates that America’s international policy has been hijacked by well-heeled supporters of Israel who—in combination with a mass media dominated by Jewish financial interests—have become the masters of America’s destiny and that of mankind itself. Piper calls this phenomenon “the ‘Israelization’" of American foreign policy.” A mammoth record of indisputable facts pointing toward the unmistakable conclusion: That the people of the United States and the world must work together to ensure Israel’s Golem is dismantled. If you have ever had any doubts about former U.S. Congressman James Traficant's integrity, doubts instilled by a long-standing media cacophony attacking Traficant, you'll soon realize that the Traficant case represents one of the most outrageous and thoroughly illegal hit-and-run operations ever orchestrated in our "democracy." It is perhaps all too representative of the high-level corruption in Washington. 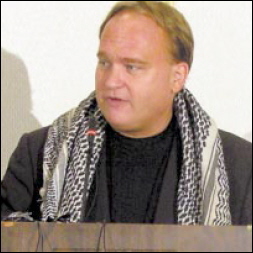 Michael Collins Piper wrote articles for the American Free Press since its inception in 2001. Prior to that he wrote for The SPOTLIGHT for over twenty years. Please see his 2005 and 2006 AFP articles archive. Please also visit our books section for more information about each book. This includes links to soft cover editions and ebook "look inside" pages. Michael Collins Piper discussed his book FINAL JUDGMENT outlining the role of Israel's Mossad in the JFK assassination as a consequence of JFK's determined efforts to stop Israel from building nuclear weapons. (Currently, the most complete edition of Piper's full length book — with the latest updates — is available exclusively in ebook form at AmericaFirstBooks.com). Please see more Michael Collins Piper videos on the Shows on MP3 / Talk Show Archive page. Zionist Influence on the America Media: Its Impact on Media Coverage of the Middle East; The Untold Story Behind The JFK Assassination, Watergate and the Lewinsky Scandal, A presentation delivered March 10, 2003 before the Zayed Center for Coordination and Follow-Up in Abu Dhabi in the United Arab Emirates. Link to the transcript of this presentation HERE. 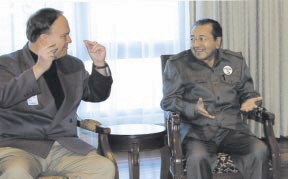 June 2006 meeting with former Malaysian Prime Minister Mahathir Mohamad in Kuala Lumpur. Sept 20, 2006 personal meeting as an AFP correspondent with Iranian President Mahmoud Ahmadinejad in New York City. 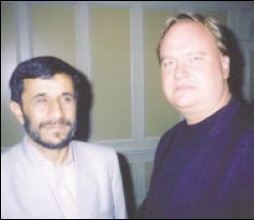 The Iranian leader subsequently invited Mr. Piper to come to Iran as his personal guest for a first hand look at his country. He did in fact visit Tehran on 11-12 Dec 2006 for the Holocaust conference. Please see his AFP articles about this event. Mike Piper was a major speaker and master of ceremonies at the Fifth International Conference on Real News, Authentic History and the First Amendment held in Washington, D.C. held over the Labor Day weekend, 1-3 September 2006. 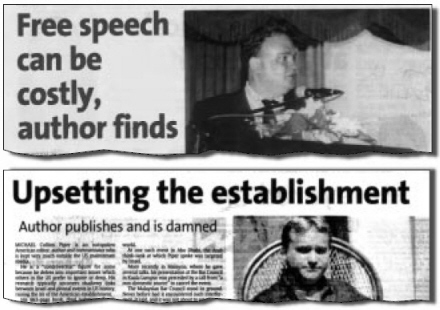 Presenting awards to free speech activists at the 1-3 Sept 2006 Conference. 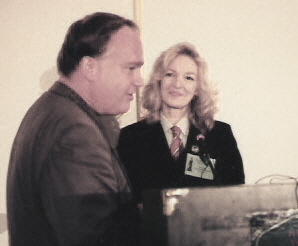 Above, Mike Piper commended Lady Michele Renouf for her support of formerly imprisoned historian David Irving and other victims of thought police tyranny.